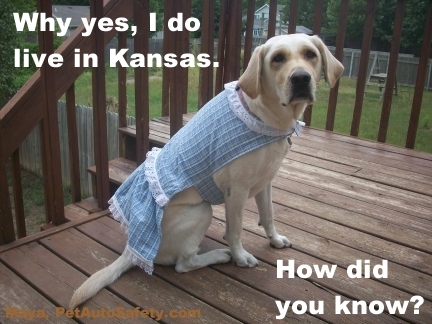 I’ve been having a lot of fun making new funny dog memes (photo captions). Most of them feature Maya and Pierson. 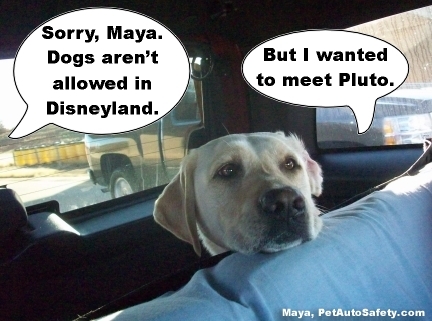 As you may or may not know, Maya and Pierson work with me for PetAutoSafety.com and PetAutoSafetyBlog.com. 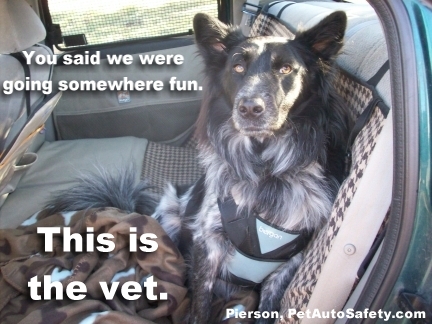 So many of the photos show them in the car while wearing their dog car harnesses. 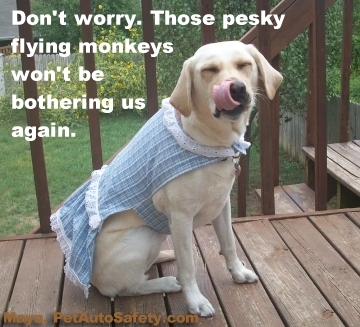 If you follow me on Facebook or follow the pet safety blog, you may have already seen some of the following memes. But a couple of them are new. Feel free to pin them! The last one is a photo where I am having trouble thinking of a funny dog meme. I’d love to hear some ideas! Can you think of a funny dog meme for this photo? What is Maya whispering to Sha Sha? 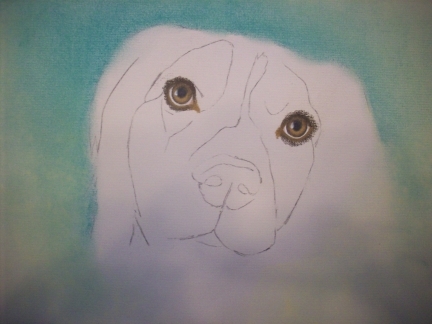 This is my second art project from my May 29th post, Thunderous Pet Portraits. 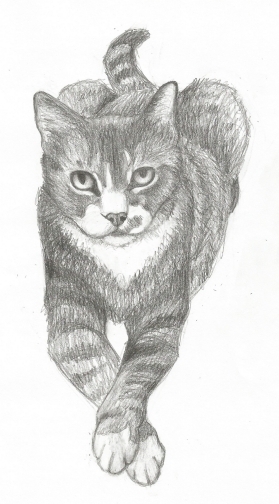 I finished drawing Deuce the cat last week. 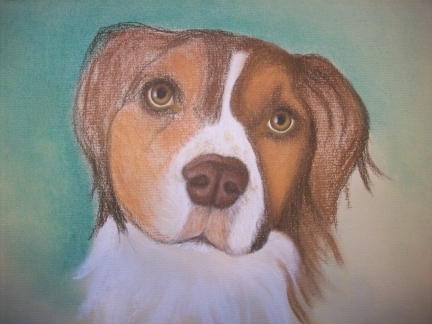 And yesterday I finished drawing Mos the dog. Below are photos from my work in progress. I also filmed myself drawing this. I had hoped to make a fast-forward video of my work in progress, but I have not figured out how to use my video editor yet. Anyway, enjoy the photos for now. This is the final sketch I completed of Mos. 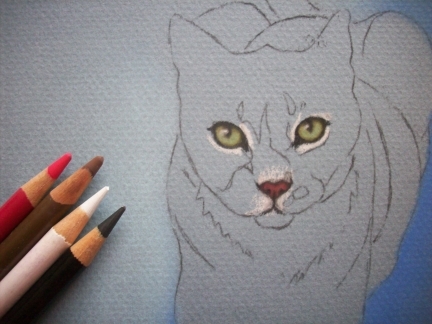 Step 1: Trace sketch onto pastel paper and complete a simple background. 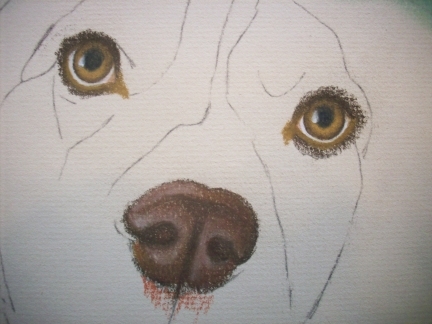 Step 2: Draw the eyes in detail. Step 3: Draw the nose in detail. Step 4: Start coloring in the face. Step 5: More of the face is colored in. This gives me an idea of colors and shading. 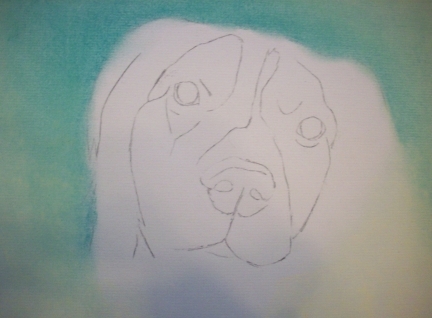 Step 6: I have added more color and smoothed out the pastels on Mos’ face. The completed work of Mos the dog. 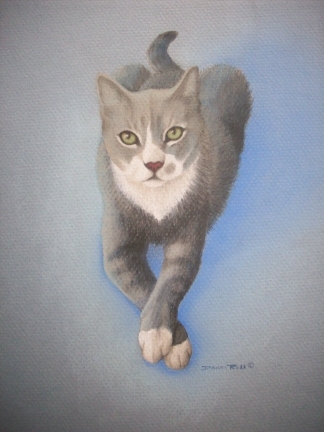 Pastels by Dawn Ross, June 25th, 2013. What do you think of Mos? He’s adorable, right? He is my aunt’s dog. She adopted him from the humane society some years ago. 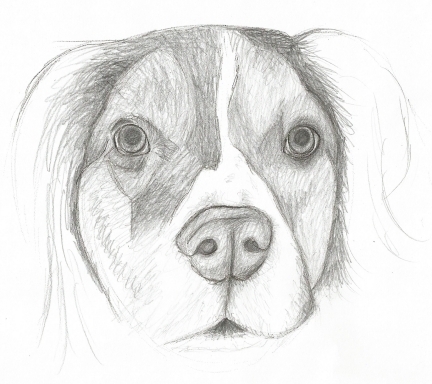 Perhaps in the next couple of weeks, I will complete the third drawing from the sketches I showed you on the Thunderous Pet Portraits post. Keep checking in! 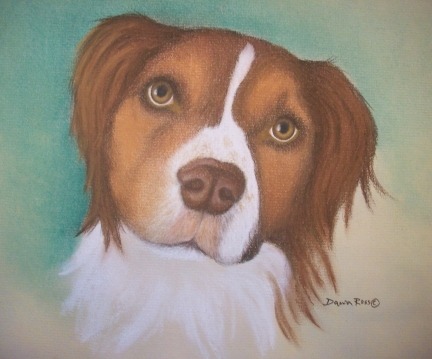 I had the opportunity at the Mutt ‘n’ Strut recently to meet the author and illustrator of “A Home for Brooks”. This book is a children’s book about a dog named Brooks. 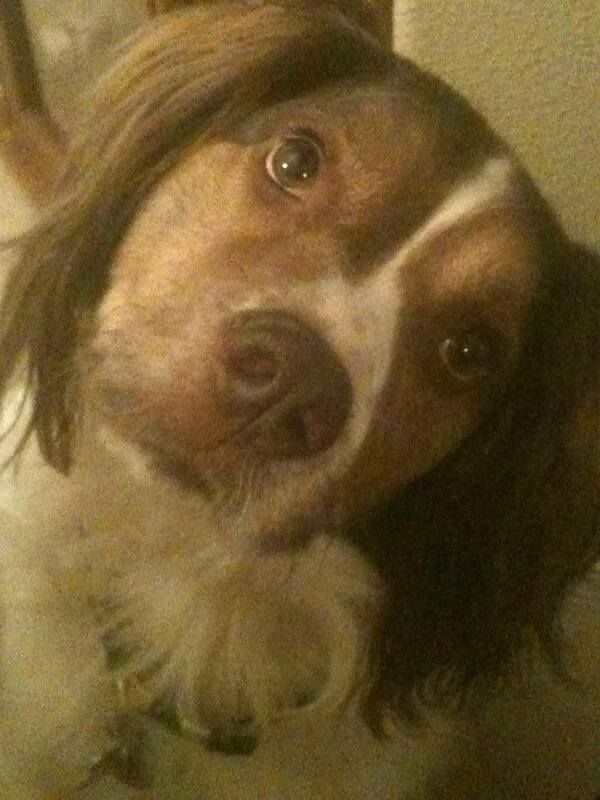 The story follows Brooks from stray to shelter to happy home. It’s heartwarming and the illustrations are wonderful. 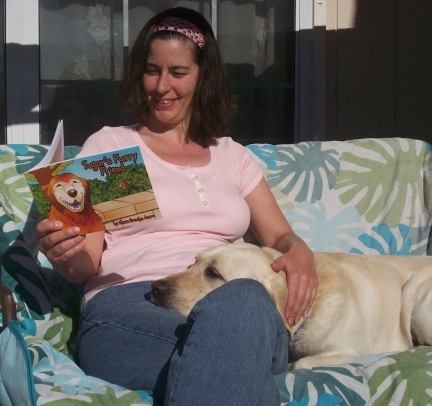 The author, Stacey Adams, isn’t just the author and illustrator of this great children’s book. She is also the Director of Education at the Books for All Foundation. The Books for All Foundation is a nonprofit organization that provides educational reading programs to children with special needs. Visit Tate Publishing to buy your copy of “A Home for Brooks”. Remember the sketches I did a few weeks ago? Well, I’ve finished the final art work of one of them. Check out Deuce! The final sketch of Deuce. 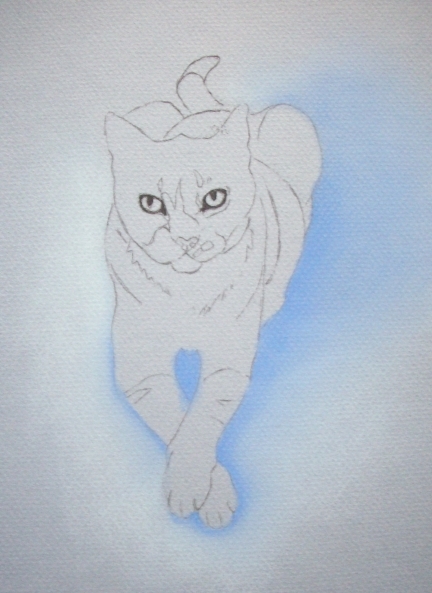 First, I trace my sketch onto pastel art paper and do the background. 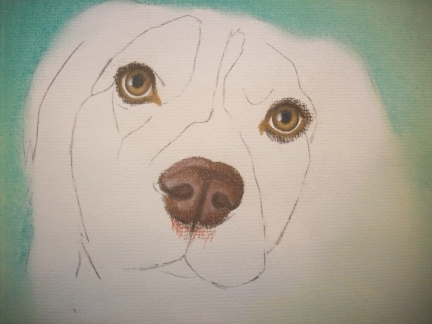 Next, I do my most favorite part – the eyes! 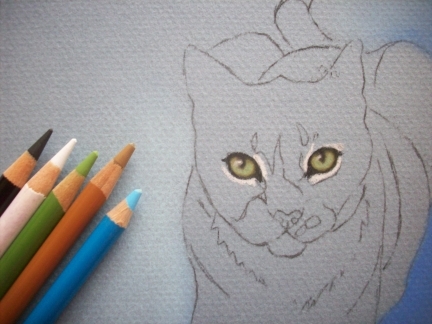 I have also included in the photo the colors of pastel pencils that I used to color the eyes. 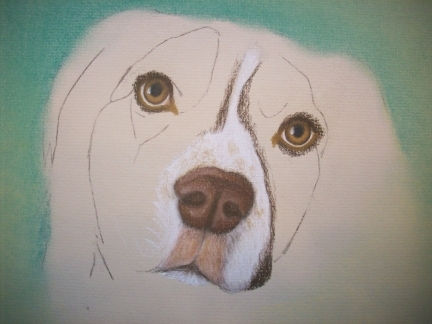 Next is the nose. 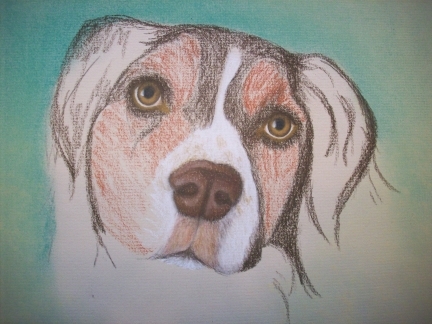 I have included the colors of pencils I used for the nose in this picture. 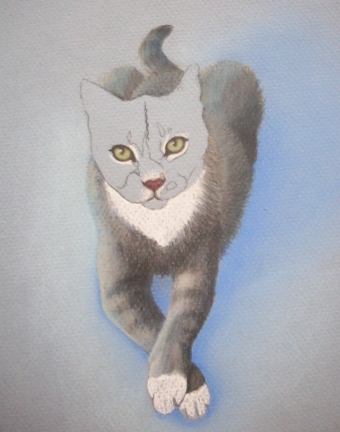 Then I start working on the cat’s body. I didn’t picture the pencils here but I used black, dark blue, light blue, grey, and white pencils. The last part I need to work on is Deuce’s head. As you can see, I first did the white parts of his face. They I lay the background color, which is black. Finished! 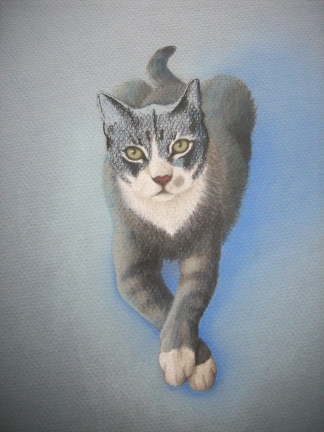 Deuce the cat has been completed in pastel pencils by Dawn Ross on June 18th, 2013. Look what we won! 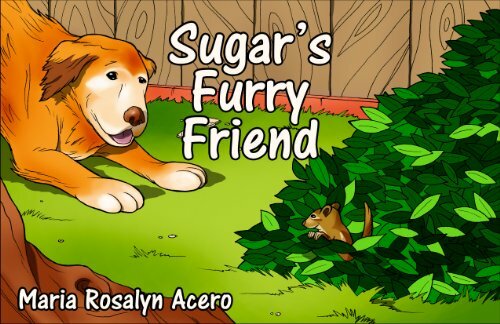 “Sugar’s Furry Friend” is a great book by Maria Rosalyn Acero. If you don’t know Sugar, she is a beautiful Golden Retriever who has her own blog, SugarTheGoldenRetriever. Maya and I are on the porch swing reading “Sugar’s Furry Friend”. My Maya loves chipmunks (which are a lot like squirrels in her mind). And she loves sitting with me on the patio swing. So I combined her two loves as shown in the photo above. 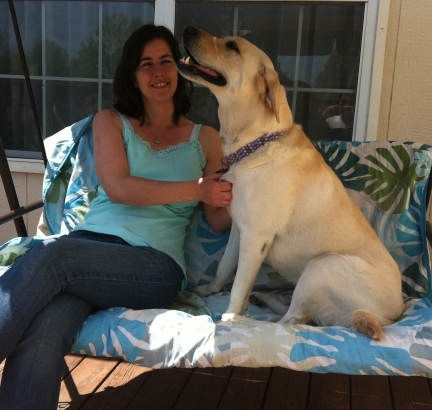 If you have children or if you just love Sugar the Golden Retriever, then you will really love “Sugar’s Furry Friend”. It is an excellent story about friendship and has lots of wonderful art of Sugar and her chipmunk friend. I was going to give this book to my nephews. But I love it so much that I’ve decided I want to keep it for myself! I can share it with all my nieces and nephews when I or they come to visit. 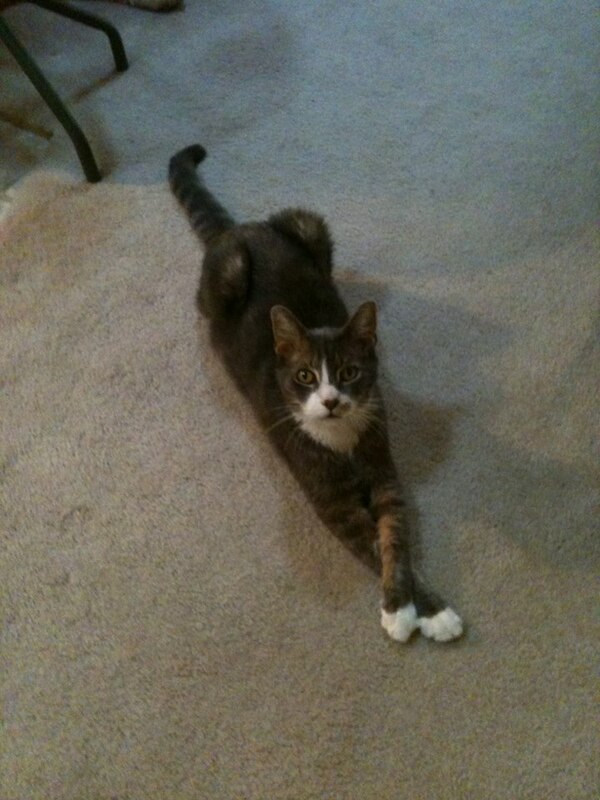 For more great Wordless Wednesday pet photos, check out the blog hop link below. 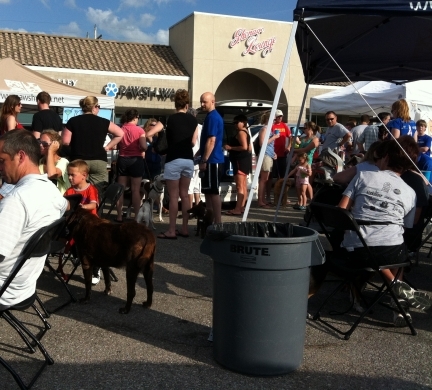 Maya, lots of dogs, and lots of people at the Lawrence Humane Society Mutt Mixer. What is a Mutt Mixer? It is an event put on by our local humane society here in Lawrence where the public is invited to bring their dog over for some outdoor fun. 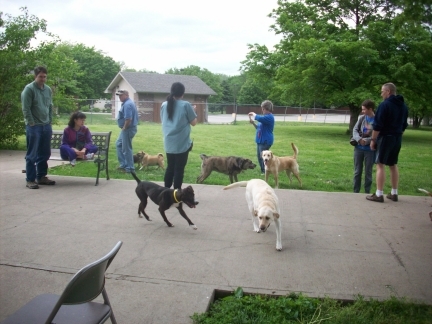 Our dogs and adoptable dogs hang out in one of several large fenced areas. Everyone has a good time socializing. We people get to ‘mix’ with other dog people while the dogs ‘mix’ with one another. This event gives the adoptable dogs get a chance to get out of their pens, practice their socialization skills, and show off their cuteness in hopes of getting adopted. 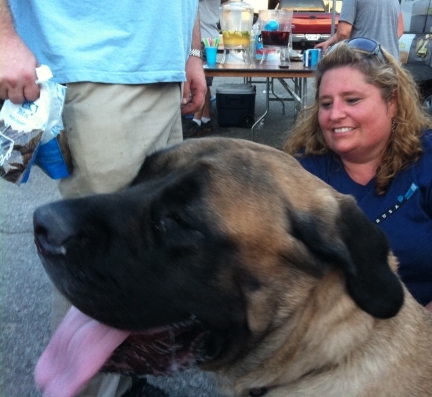 Lots of dogs at the Mutt Mixer. Maya is going to go introduce herself. Ooops! Someone’s getting a really good sniff. Hi Maya! Maya came with me to this recent event and had a great time. 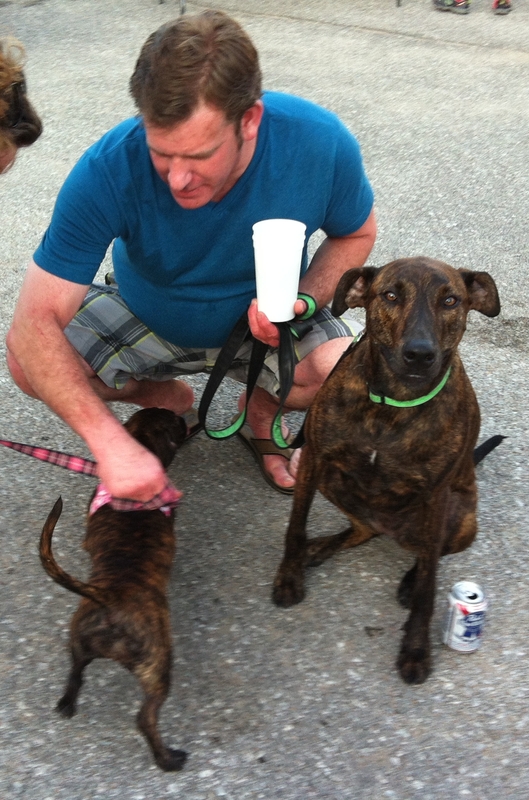 She loves socializing with other dogs and with people too. I had a good time as well for the same reasons. 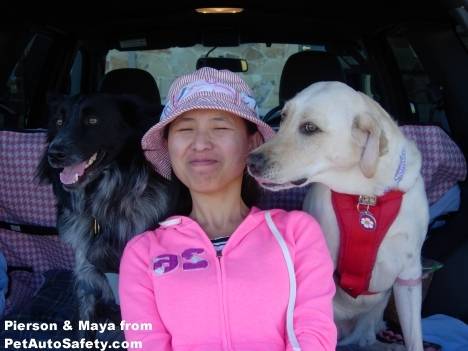 Unfortunately, Maya started showing symptoms of a doggy cold about a week later. 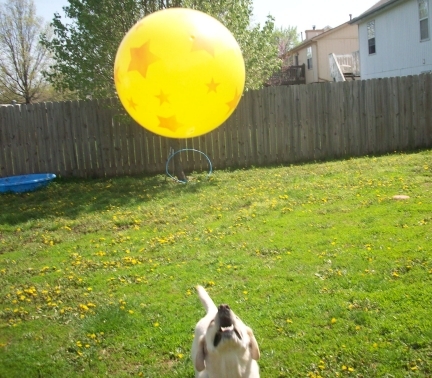 I’m not sure if she caught it at the Mutt Mixer or not, but the vet seems to think so. Fortunately, it is not serious. She just has a slight runny nose and sneezes from time to time. She is almost over it, but now Pierson has it. We were warned at the Mutt Mixer that although the humane society is not currently having issues with bordetella, there is still a possibility of it. Bordetella often happens when you get a large group of dogs together, even if you take all the precautions and keep the facility clean (as our humane society does). I signed a waiver saying I understood this. Before I attended the event with Maya, I also confirmed with my vet that she was up to date on her bordetella vaccination. So I don’t blame the humane society in any way for Maya getting sick. What is bordetella? I call it a doggy cold. Like our common cold, there are many strains. So even though Maya had a bordetella vaccine, she still caught it because it was a different strain. Like our common cold, it is relatively mild and doesn’t last long. Also, like our common cold, it is harder on the young and old and it can be complicated if there are other health concerns. And like our common cold, the symptoms can vary. Mild symptoms include coughing, sneezing, or runny nose. More concerning symptoms include fatigue, fever, loss of appetite, or even pneumonia. Maya has visited the vet and she does not have any of the more severe symptoms. Read more about bordetella, or kennel cough, on PetMD. 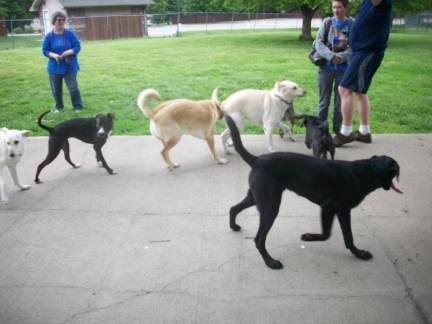 If having large groups of dogs together increases the likelihood of someone contracting bordetella, this means Mayta could just as easily get it at the dog park or doggy day care. I’m interested in knowing what you think of our Mutt Mixer event. Do you think Maya might have gotten sick from it? Would it make me irresponsible to take her to the next Mutt Mixer event in July? What are your thoughts? 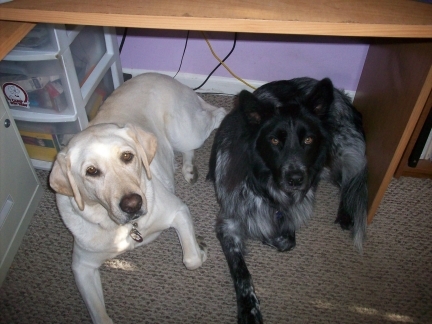 Maya and Pierson are working hard under my desk and earning their kibble. I think they deserve a raise. For more Wordless Wednesday pet photos, check out the link to the blog hop below. Feed twice a day – Some dogs do well at being fed once a day while others, especially younger dogs, need fed at least three times a day. Consult your veterinarian for the proper feeding schedule and amounts. Some estimated feeding instructions on dog food bags are inaccurate. 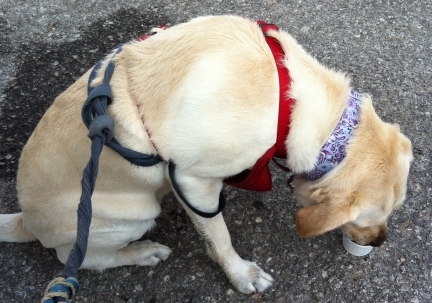 Give plenty of water – I always make sure their water bowl is full of fresh water. Potty time – I let Maya and Pierson outside several times throughout the day. Pick up poop from the yard – Sometimes you can get away with doing this ever-other-day or even once a week, but for optimal health (and so Pierson won’t eat Maya’s poo), I do this every day. 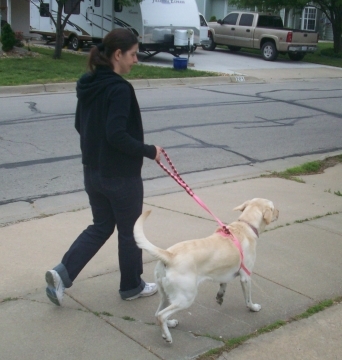 Walk – Every dog needs exercise. How much varies per dog. Some dogs need more vigorous exercise, like running, while others just need a short jaunt. Maya and Pierson each walk about a mile or so almost every day (except in winter when I tend to get lazy). 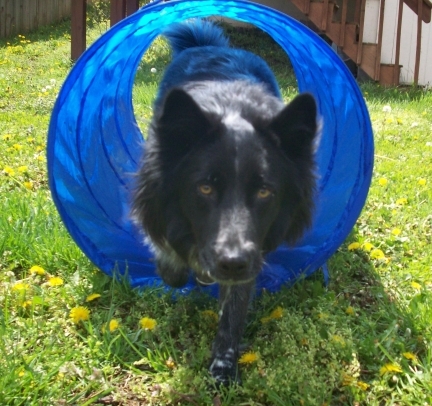 Play – How often and how long varies per dog. Pierson has dog agility equipment in the back yard. He doesn’t use it on his own. I direct him to it and it is both playing and dog training. Both Maya and Pierson get bored with play after about 15 minutes or so. Brush teeth – I never had to do this every day until I got Pierson the poop-eater. Some dogs who are good chewers can get away with a weekly brushing with a dog tooth brush and toothpaste. 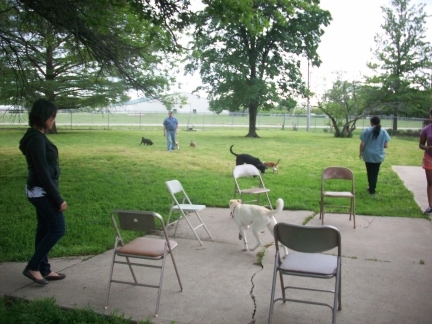 Dog Training – Regular training is always a good idea, no matter how low maintenance the dog is. I do a short session of 3 minutes or more of dog tricks or obedience in order to keep the things I taught them fresh in their minds. Wash food and water bowls. I take the dogs for a walk almost every day. 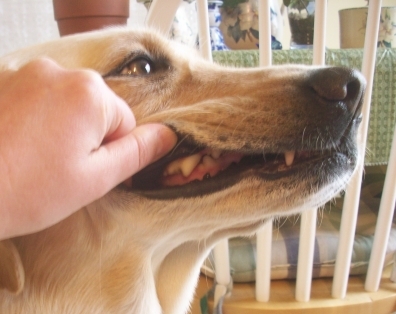 Brush your dog’s teeth so they look healthy like Maya’s. Maya’s not usually allowed on the furniture in the house, but I always let her cuddle with me on the outside porch swing. 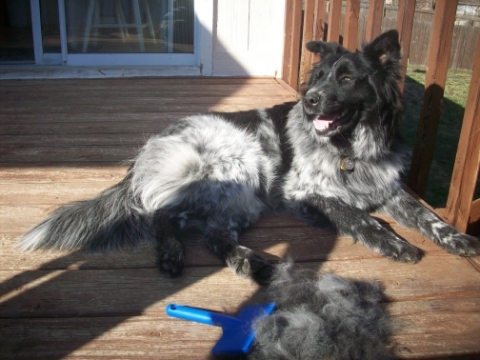 Brush hair – In spring, Maya and Pierson need this done daily with de-shedding dog brushes. 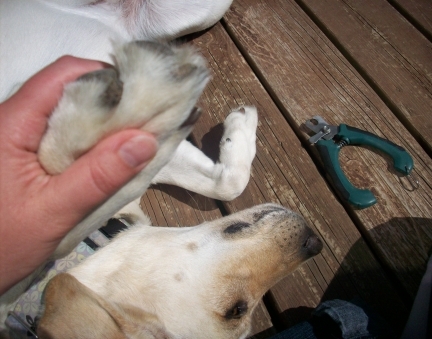 Some dogs may require more brushing while others may not require any. Check ears and eyes – Clean as needed. Maya sometimes gets goo in her eyes. Pierson tends to get gunk built up in his ears. Springtime means more use of the de-shedding dog brush. Maya lies on the porch quietly and calmly as I cut her toenails. We’ve been doing this almost every week since she was a puppy. Give a bath – Additional grooming may be needed for dogs that need haircuts, such as the some non-shedding varieties. Give medications – I give my dogs monthly Heartgard and flea and tick preventions. Some people have found more natural remedies to prevent against heartworms, fleas, ticks, and other pests. A wet Pierson after a bath. 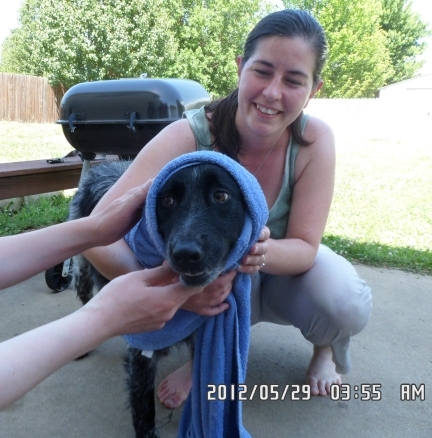 In summer, I give the dogs a bath outside. In winter, we go to Pawsh Wash. 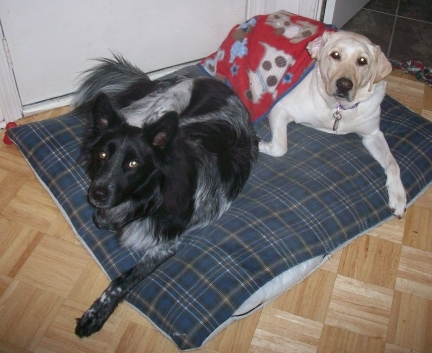 It is probably time to wash the dog beds and blankets again. Visit the veterinarian for an annual checkup – Additional visits during the year may be needed for unexpected health issues. Travel – My husband and I travel at least twice a year. 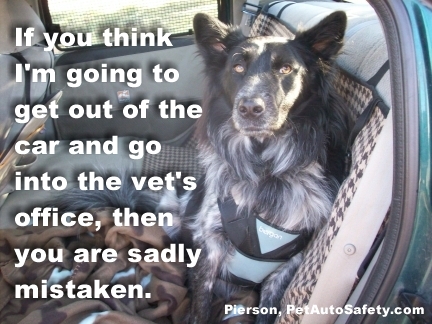 When we do, we either take the dogs with us or find someone to take care of them while we are gone. 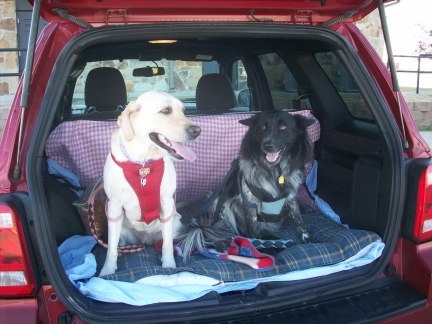 When they travel with us, it is by car and they wear their dog seat belts. 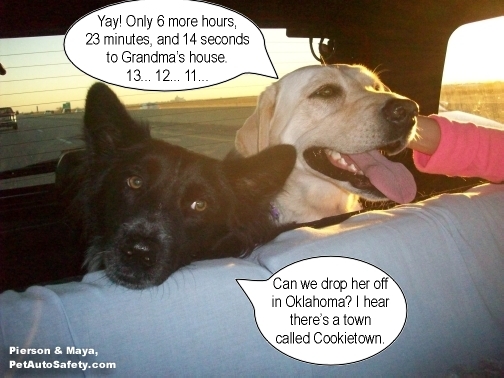 Maya & Pierson ride in the back of the SUV for our trip from Kansas to Texas. 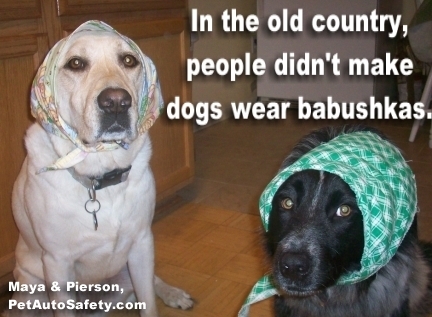 Both are wearing dog seat belts. 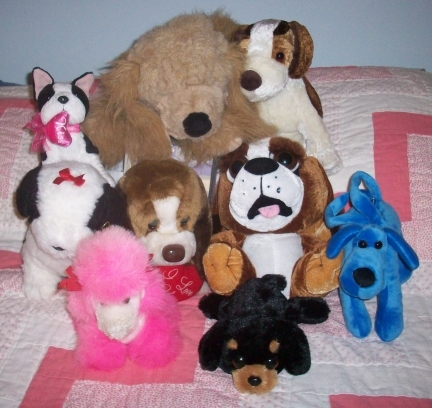 These are things all dogs need. So if you don’t have a dog, you want a dog, but want one that doesn’t require much responsibility, then look this list over carefully. If you feel you can’t provide one of them, then consider the kind of low maintenance dogs in the photo at the top of the page. Real dogs require real work. Fortunately, the rewards are infinite. Did I forget anything? 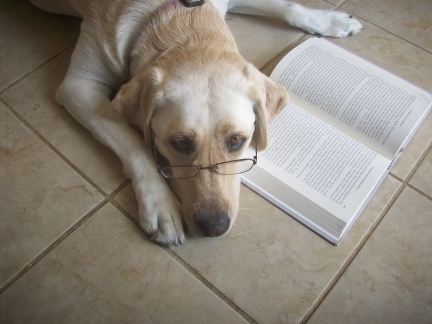 What regular tasks do you do for your pets? ***Added later… Rumpy Dog asked an excellent question. The purpose of my article was not to point out all the things you should be doing. I do not intend to criticize anyone who might do things differently. How I choose to care for Maya and Pierson are not intended to be held up as an ideal. I am not perfect. The purpose of this article is to show people who are considering getting a dog and people who are looking specifically for low maintenance dogs that there is still a lot of work that goes into caring for a dog. It is very sad when someone buys or adopts a dog, then gives them up later because the dog is more work than they expected. See my reply to Rumpy Dog below.